It’s TINSTAAFL Tuesday. I wasn’t sure what I was going to post about until I saw this bit of future possibility of science fiction becoming reality. Speculative fiction might be a better description of it. The article talks about the possibility of harnessing the dust from an asteroid to help reduce global warming. The dust could act as a sunshade. 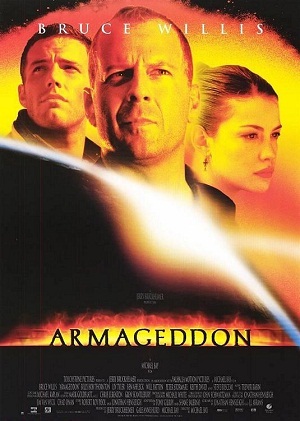 In the movie Armageddon, Harry (Bruce Willis), A.J. (Ben Affleck), Dan (Billy Bob Thornton), and several other key men (and other amazing actors) must save the Earth from the impact of an asteroid. Meanwhile, Grace (Liv Tyler) waits for her father, Harry, and her boyfriend (A.J.) to pull off the impossible or die. Well, if they die, everyone on Earth dies, too. There is a difference between saving the Earth from impending doom, as in the movie, and geoengineering. Yes, I know that the movie was fiction and full of inaccuracies of real science. It was entertaining and fun to watch, and the characters in the movie had no free lunch. Their lives and sanity were at risk the entire time. I’m not altogether sold on the theory of global warming, mostly because I think the planet is what it is. The jury is still out. Yes, humans do a fine job messing with the environment, but Earth is not static. There is so much we don’t know about the planet. Back to the idea that we could harness an asteroid and nudge it close enough to Earth so that its dust particles shade us from the sun to cool us down a little bit. But how do they calculate the tiny 1.7 percent reduction? What if there is a miscalculation or misinterpretation of data? Also, there is a concern for safety. The percentage might be miscalculated. A 17 percent change is significant whereas 1.7 percent isn’t. I presume the scientists involved are much better at math than I am though. The weight of the asteroid is bigger than thought so the momentum carries it too close for comfort. And since the scenario in Armageddon isn’t realistic, the people in charge of space will have to come up with another plan while our moon is hurdled into a different orbit. Very nice! I just came up with new science fiction story ideas to start working on. Cool! Thanks, geoengineers! Did you see the movie, Armageddon? If so, did you like it? Do you do anything on your own to help the planet (recycle, drive a hybrid vehicle, ride a bike to work)? What do you think about the possibilities of geoengineering to safeguard the environment?